A dreamy snow drifted down on Saturday with fluffy flakes that made New York City look like a snow globe, but officials warned cold, icy weather could make for difficult driving conditions overnight and Sunday morning. Between 3 and 7 inches were recorded across the tri-state by the time snow tapered off late Saturday night. More than 4 inches were recorded in Central Park, while 4.6 inches was measured at LaGuardia, 4.7 inches in Ridgewood, New Jersey, and 6.1 inches in Armonk, according to the National Weather Service. The highest total was 7 inches, recorded in both Shelton and North Haven in Connecticut. See more snow totals here. A daily snowfall record was broken at Islip Airport. More than an inch fell at the airport, breaking the record of 0.5 inches set in 1986, the National Weather Service said. A father and son shared their first sled ride and tourists visiting from around the world said they got to experience the New York winter wonderland they'd only seen in movies. Rana Novini reports. The snowflakes stuck to hats and coats of the crowds that came for a glimpse of the Rockefeller Center tree in midtown. The flakes created a snowy slush along Queens Boulevard and coated yards in white from Chappaqua to the Jersey Shore. The snowstorm caused flight disruptions at Newark Airport and even canceled a planned snowball fight in Ocean County. Six Flags Great Adventure in Jackson was scheduled to try to break the world record for the biggest snowball fight -- but the park was closed Saturday because of the storm. 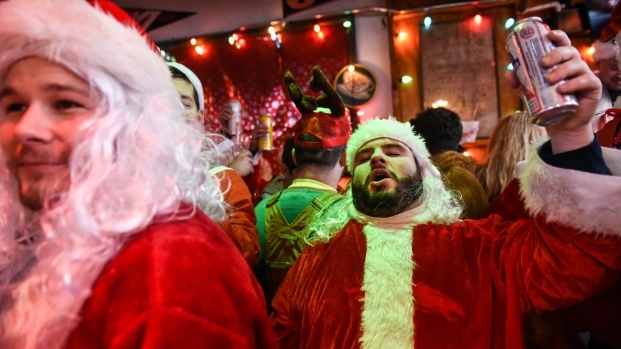 Hundreds of people dressed as Santa Claus turned out to bar-hop for SantaCon in spite of the snow and to the ire of some residents put off by the annual, booze-filled tradition. Track the storm using our interactive radar and see the latest weather alerts for your neighborhood here. The snow had mostly ended by late Saturday night, but officials warned falling temperatures could lead to black ice on roadways and untreated surfaces overnight into Sunday. Wind chills will stay in the 20s throughout the day Sunday, with wind gusts of more than 20 mph, Storm Team 4 said. Monday will be less breezy, but still chilly, with temperatures barely reaching the 40s. Then, on Tuesday, there's another chance for light snow as another cold front moves through the region, plunging highs 20s and 30s through next weekend.